Amazing engineering from Dragon produces another top performing wrap style sunglass that floatable! Shiny Woodgrain with Copper Ionized Lens. Matte Black H2o with Smoke Lens. 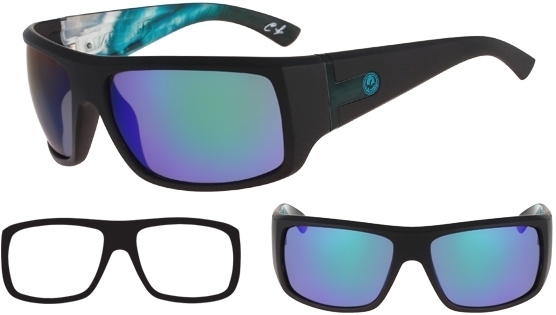 A high grade super polymer material, grillamid, forms the durable and flexible 8 base wrap frame and the low molecular polycarbonate lenses give total protection from all UV light, and the harmful blue light that many fashion sunglass brands fail to even speak of. Variable Configuration Geometry (VCG) runs through this model like many of the newer Dragon styles. It means you get crystal clear, no-distortion optics from any angle of view through the lens, and that's mighty important for the longevity of all those tiny optical nerves that work hard every day.